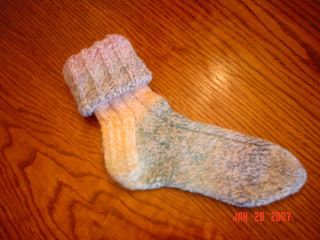 In January I decided I would try to accomplish one of my New Year's resolutions -- to knit socks. I had trouble with the heel and almost gave up. However, after a trip to Yarn Works in Grand Rapids, MN, where the owner encouraged me to just follow the directions even if they didn't make sense to me, and S-h-a-z-a-m -- I did it! This is a pattern called "Wide Wale" using Encore Colorspun Chunky. I like the variegated colors! yay for you're first post! great job mom. I love your socks. Those are great first socks! I'm impressed! The colors look lovely, too.